Yoga comprises several physical, mental, and spiritual practices and disciplines, with origins in ancient India. Its initial emergence can be traced back as far as the fifth century BCE. Yoga first gained prominence in the West by the late 19th century. The practice subsequently grew to become widely popular in Western societies by the 1980s. As at 2015, the number of people practicing yoga in the U.S. alone stood at around 36.7 million and is projected to reach over 55 million by 2020. Revenue from the yoga industry in the United States amounted to 9.09 billion U.S. dollars in 2015 and is projected to reach over 11 billion U.S. dollars by 2020. 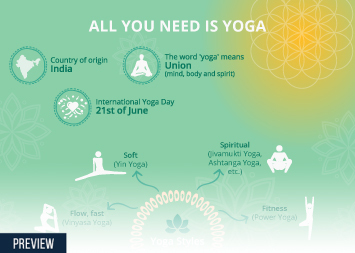 Contemporary practices of yoga in modern Western societies focus on fitness and physical exercise while its traditional Indian counterpart was mainly a spiritual exercise with focus on meditation. There currently exist a multitude of styles and philosophies associated with the practice of yoga that range from the energetic to the calm and meditative. The different schools of yoga each consist of specific attributes that may suit an individual according to their individual needs. Some of the most popular types of yoga practiced in the United States include: Acro Yoga, a physical practice which combines yoga and acrobatics; Power Yoga, a discipline that combines stretching, strength training, and meditative breathing; as well as Anasura, a relatively new form of yoga which combines principles of alignment with a playful spirit. In a 2016 Statista survey, 42 percent of respondents professed to practice yoga mainly for the purpose of increasing their personal well-being. Number of yoga participants in the U.S.